U.S. 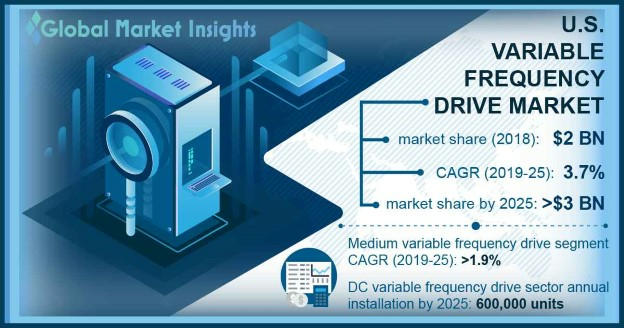 Variable Frequency Drive Market size will exceed USD 3 Billion by 2025, as reported in the latest study by Global Market Insights, Inc.
Increasing environmental concerns coupled with the introduction of directives and standards toward energy efficiency will drive the VFD market across the U.S. Ongoing urbanization, rising industrialization, and the shift in focus on effective energy utilization across various industries will augment the industry landscape. Furthermore, government incentives & funds, R&D investments, technological enhancements, and rising demand for advance product portfolio are key factors positively influencing the business scenario. Medium-voltage drives, in the current industry scenario have observed growth subject to their wide application across the commercial and industrial establishments. Rapid retrofitting & refurbishment of existing units & solutions in conjunction with industry standards and codes has re-structured the U.S. VFD market dynamics. Increasing fund flow coupled with aligned industrial focus towards the upgradation of traditional technologies will further amplify the industry growth.